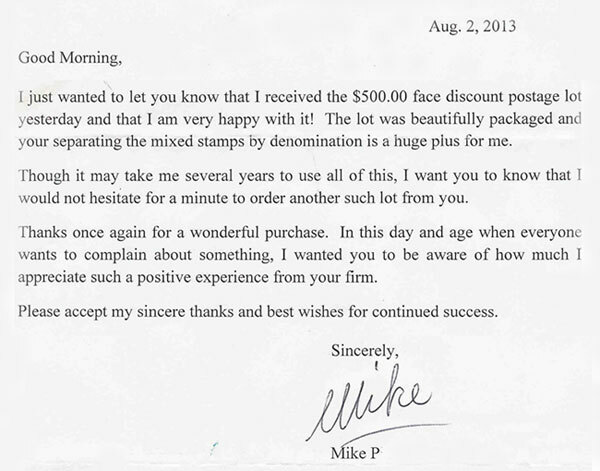 Business people love our discount postage because it allows them to save money on all of their USPS shipping. Because shippers are usually more interested in the discount they receive than the specific stamps, this is a great opportunity to stock up. Discounted postage, simply put, is US postage sold under face value. This postage is perfectly legal to sell, buy and use on all your USPS mail. The secret is that the volume of stamps sold to collectors over the last 50 years is enormous: often much larger than the demand from today´s collectors. When these stamps were purchased, the post office received full face value for them. Today, when large accumulations come on the market, our position as a one of the largest US mint stamp dealerships allow us to buy them in bulk at current market prices, often below face value. Many mint stamps have increased in value! The stamps which have not appreciated in value to collectors, we can now offer to you for your postage needs at less than face value. Our discount rates can vary from 16% to 3%, depending on the type of postage. For example, bulk rate, non-profits and precancelled stamps, which require a special (and easily obtained) permit are sold at the greatest discount. On the other side of things, current rate first class self-adhesives in large quantity can be as low as 3% off of face, but only when available. If you are a casual mailer or someone who needs postage for large mailings or vintage stamps for wedding invitations, we can supply you with stamps at a rate that will really save you money! All the postage we´re offering is mint, with gum, and legally useable for mailing letters, boxes, parcels, or whatever you send through the USPS mail system! Virtually all of the stamps are collectable quality, but we´re selling them as postage! Lower denomination stamps (1-4¢) are sometimes available, but they tend not to be collector quality. Please inquire for current availability. This transaction cannot be completed from the Shopping Cart. To order, simply contact us and let us know what you want! Email, phone, fax, or regular mail are all welcome. We accept personal checks, money orders or bank transfers. If you are mailing your order and payment, our address can be found by clicking on the "Contact Us" tab found on the top menu. TERMS OF SALE: Payment by check, money order or bank transfer. SHIPPING: $100.00 face - Shipping $3.50. $200.00 face - Shipping $5.00. $300-$499.00 face - Shipping $7.50. Free Shipping over $500.00 face. All shipping charges include insurance for your protection and ours! Shipping is normally by USPS Priority insured w/ tracking or UPS Ground. Upgrades to Overnight, UPS 3 Day etc. are available for faster delivery at cost. Please Call. A UPS delivery address is required for any UPS delivery. Currently, orders will be shipped within 2 - 7 days of receipt of payment. Over 30 Years of Selling Discount Postage to Satisfied Customers! !